In the popular culture Lahore’s origin is tied to the Hindu mythologies. There are historians who argue that before the walled city of Lahore became Lahore, Lahore actually was the locality of Ichhra. A very interesting observation is presented to substantiate the thesis. Mostly what we find in the appellations of the doors of a walled city is that the gates are named after the city which they face. 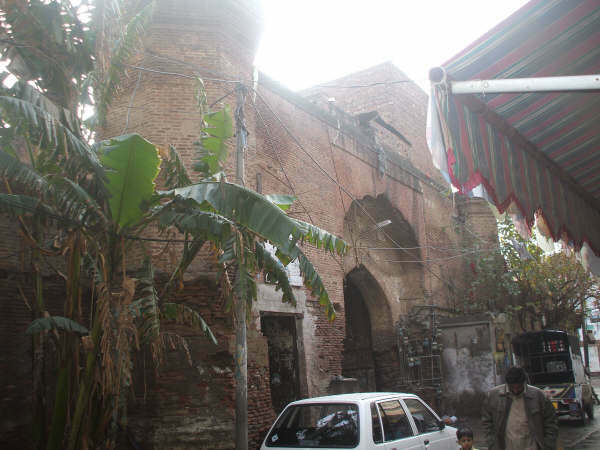 The Delhi darwaza of Lahore is named so because it faces Delhi, so is the case with the Kashmiri darwaza. There has been some controversy regarding the name of the Lohari darwaza. It is argued that the Lohari darwaza points towards Ichhra. Lohari could be a primeval name of Lahore in this case, and Ichhra would be that historical city of Lahore. This is a plausible contention according to the British Gazetteer of Lahore, because they argue that two of the oldest Hindu temples are found in Ichhra, viz. Bheeru da asthan and Chand Raat. Sadly, the latter has been lost but the former still looks over the city. However, the question that arises is that on what premises the British say that this temple is one of the oldest temples. The architecture of the building does not suggest this nor do the folk tales. The temple is on the Ferozepur road behind the Shama stop. In fact the Shama and the Sheesh Mahal cinemas stand today where once the huge pond of the temple was. According to Maulana Noor Ahmad Chishti, there once lived a man called Godar during the tenure of Shah Jahan. He used to handle the accounts for Dara Shikoh, the eldest son of the Emperor at Benaras. When the prince had an auditor analyze the accounts, it was learned that the accountant had been stealing from the treasury. On this the prince gave the man capital punishment. Legend has that as Godar lay in the prison waiting for his turn to go to the gallows, a man appeared before him. This man asked him to close his eyes and he did as he was told. When he opened his eyes, he found himself at the exact location where today the tall, cone-shaped structure stands. It was a Sunday. The man who had brought Godar here, was sitting on a camel and he was standing next to him. In utter amazement, he asked the man who he was? The man replied that he was Bheeru after which he disappeared. Bheeru is derived from the Sanskrit word of Bherv, which means Bogey-man. Bheeru is an incarnation of the Lord Shiv-Rudar, who is the Hindu deity of destruction. Shiv-Rudar travels on a dog, and the fear that he excites is such that even the witches and the ghosts are afraid of him. He is usually found near the cremating grounds. Godar was a follower of Bheeru, and after the miracle, he demarcated the spot, where Bheeru stood, and started his search in the city. He ended up at Shah Alami, where he started living near the Pari Mahal. After adjusting in the new city, he one day gathered a few Hindus and took them to the spot. There he narrated to them the story of Bheeru, after which the spot became known as Bheeru da asthan. He along with other followers made it a regular practice to visit the spot, and present it with garlands, as a token of their reverence. In this way seeds were sown for this place to become a site for one of the most sacred Hindu temples in Lahore. Later, during the tenure of Ranjit Singh, the mother of his concubine Mora once fell sick. She was diagnosed to have been affected by djinns. Mora was informed that one of the descendants of Godar practiced magic, and he would be able to rid the body of the intruders. According to tradition, she summoned him, and he was able to cure her mother. As a reward for his services, Mora ordered all the villages that were granted to her by the Regal to bring forth a cart of bricks for the construction of a proper temple at the asthan of Bheeru. Bricks from all the hundred villages that fell under her sway came forth. Besides the bricks the total expense for the construction of the present day temple was around 1400 rupees. This temple was further extended by Ram Chandar, the nephew of Sanwal Mal, who was a minister of the Ranjit Government. Besides him contributions were also given by Raja Lal Singh. There is a big main gate which is followed by a corridor for the entrance to the edifice. At the end of the corridor is another gate. The corridor is around 3 yards wide and 13 yards long. It is embellished by arches on both the ends. Flanking the entrance are rooms. A ground used to follow the entrance whose dimensions were recorded to be 17 x 11 yards. Now however the ground has been taken over by refugees from the other side of the border and new houses have sprouted everywhere. This corridor was added by Raja Lal Singh. The area east from here was the Langar Khana, where people were given free food. In front of this is the octagonal platform upon which the temple stands. There was also a well next to it. On each side of the temple are arches (mehraab like structures). East from here is another enclosed place where now houses stand. There is a big door here that opens towards the temple. Next to it is a platform where there are 8 samadhis. 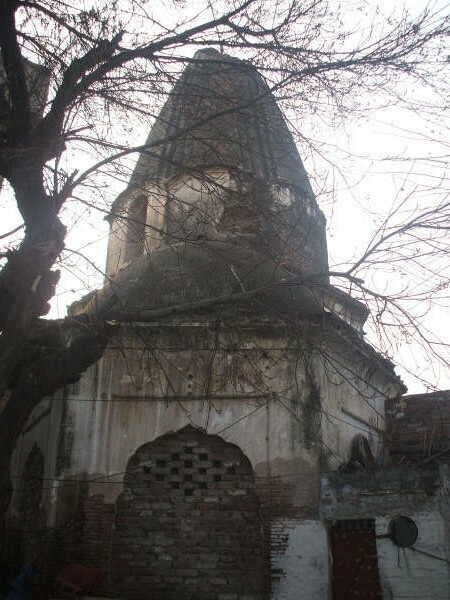 During the riots following the Babri mosque incident in Ayodha, like other temples in Lahore, people tried to bring this temple down too, but since it was made of strong material, it luckily survived. Even though the story of Godar is hard to believe there is no doubt that the present day shape of the temple was given to it during the tenure of Ranjit Singh. One plausible reason as to why this temple is called ancient by the British is that the spot where the temple now stands must have been the site of a primordial temple, which has now given way to a modern construction. It is said that a lump of mud signified the holy place before the temple, making it reasonable to believe that some sort of building existed here before this one, and later on the story of Godar was explained for the inception of the temple. This entry was posted in Lahore and tagged Ayodhya, Babri mosque incident, Benaras, Bheeru, Bheeru das than, Bherv the Bogey-man, British Gazetteer, Chand Raat at Ichhra, Delhi Darwaza, Ferozpur road, gateways of Lahore, Godar accountant of Dara Shikoh, Hanjarwal, Haroon Khalid, Hindu mythology, Ichhra, Kashmiri Darwaza, Lahore, Lahore’s origin, Langaar Khana, Lohari Darwaza, Maulana Noor Ahmad Chisti, Mora the concubine, mother of Mora, Niaz Baig, oldest Hindu temples in Lahore, Pari Mahal, Raja Lal Singh, Ram Chandar nephew of Sawan Mal, Ranjit Singh, riots in Lahore following the Ayodhya incident, Shah Alami, Shah Jahan, Shama cinema, Shama stop, Sheesh Mahal cinema, Shiv-Rudar the Lord of destruction, Smadh, villages around Lahore. Bookmark the permalink. ThankYou for sharing such an interesting piece of information about Lahore which was previously obscured. I will certainly look upon Icchra next time with more reverance. stories…..stories of our common past. want to visit Lahor once…but it seems impossible……there is too much to experience..thanks for the information. Dear Amjad, I suggest you that when you put something on your blog about a place, note the coordinates of that place and write in your article. You can use google earth. Simply put the cursor on the desired place and press control-shift and C. Then simply control v to paste the coordinates. For example you can visit my blog.